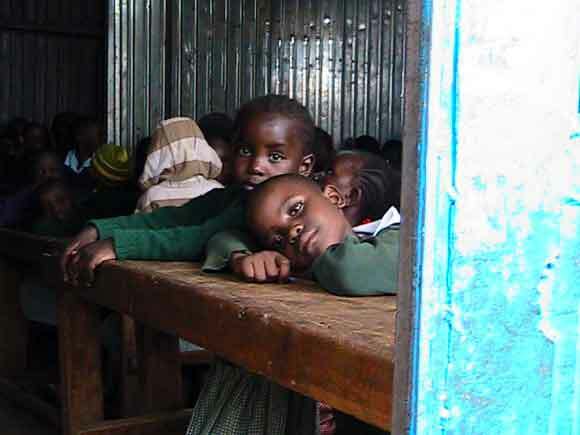 Every year Rotary chapters around Kenya commemorate their “World Health Day” by going to resource-poor schools and speaking about the importance of hygiene, distributing packs consisting of toothbrushes and toothpaste, and providing children with de-worming tablets. I rode out to Kibera with Zee, a coordinator of a Rotary Club in Nairobi. 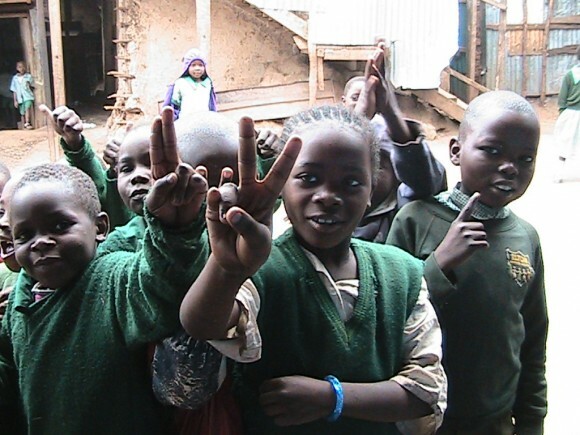 Kibera is your token “slum” community, the largest in Nairobi and one of the largest in East Africa. It has been intensively studied, being located near the UN headquarters, it is a place that’s been featured in films and it is a place slum tour groups operate. The object of the day was to identify two schools, speak to the children about basic hygiene such as hand washing and the regular brushing of the teeth, doll out toothbrushes, and administer de-worming tablets to each student to get rid of any worms possibly acquired through unclean water or food sources. Initially, the plan was to coordinate this event with the District Officer (D.O.) 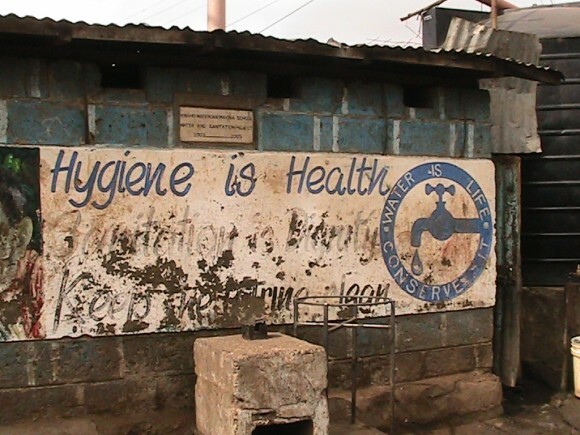 of Kibera and Community Health Workers so that the community would be receptive to the event. Makes sense. Rather than having random outsiders come in on their own, random outsiders and community health members could work together to ensure a successful event. Unfortunately, Kibera’s D.O. said that her workers required some sort of financial contribution for their work, but Rotary had no monetary budget – supplies were being donated by sponsors. So now we have a situation where Kibera’s D.O. has withdrawn from engaging in the event completely, the Rotary Club is being given supplies to distribute, and Zee, who is committed to a successful event is left to execute the event in Kibera, a place unfamiliar to many Rotarians, including herself. Driving through Kibera’s narrow and bumpy streets, it was clear that we were a bit out of place. We had to ask a few people in the streets where Calvery Primary School was located before arriving. The school was marked by a wooden door with a painted sign that was half cut off in a way that made it seem as if half of the door was missing. We walked through the door and saw a sign for Calvery Educational Centre, which led us to the courtyard of the school where we were greeted by Julius, the school’s headmaster. He welcomed us but insisted that he did not want to disrupt too much class time for the students. The children peered at us with inquisitive eyes and only waved and smiled after we waved and smiled first. Some were timid and some were eager to pose for pictures. The school had a fairly large courtyard surrounded by classrooms, a kitchen, and the headmaster’s office. 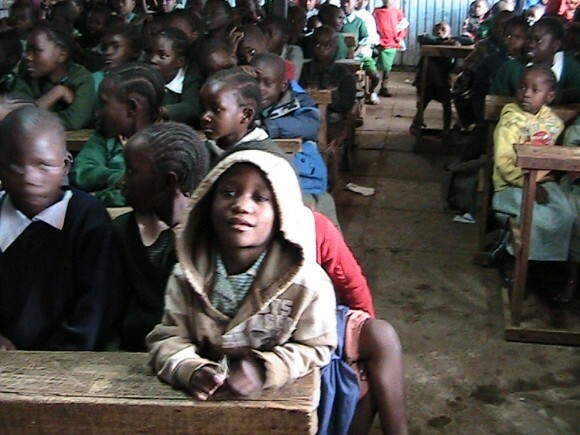 Classrooms were separated by an iron sheet wall and children sat on rustic wooden benches. While Zee had arranged to pick up supplies the day prior to the event, this did not occur because the supplies had not been delivered on time to the designated collection spot. Since supplies were not at the school when the volunteers were, the volunteers proceeded to continue with the demonstrations using props instead of actual soap and toothbrushes. The students were quite engaged in the discussions about hygiene and participated by answering questions and asking their own. Most agreed that they perhaps did not drink enough water throughout the day, but did understand that acceptable drinking water had to be boiled or treated. One student said he did not own a toothbrush so asked if brushing his teeth with a stick was okay. 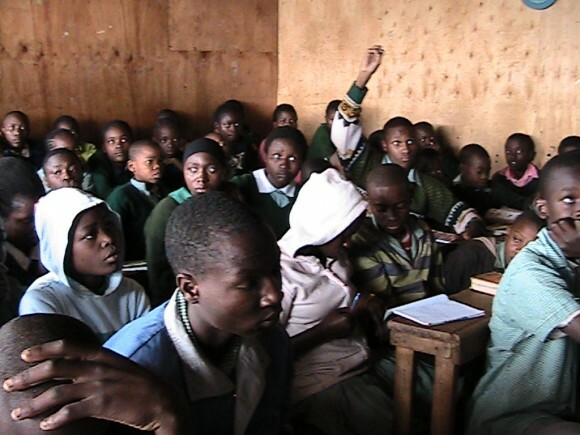 The younger students were addressed in Kiswahili and the older students in English. The demonstrations occurred even before supplies arrived because because Julius, the school’s teacher, was insistent that he did not want to disrupt too much class time with our event. When the supplies finally did arrive they were not ready-to-distribute packs. There was a large sack of toothbrushes, a large sack of toothpaste tubes, a large sack of toothpaste samples, small packs of plastic bags, and small pieces of paper explaining proper hand washing. 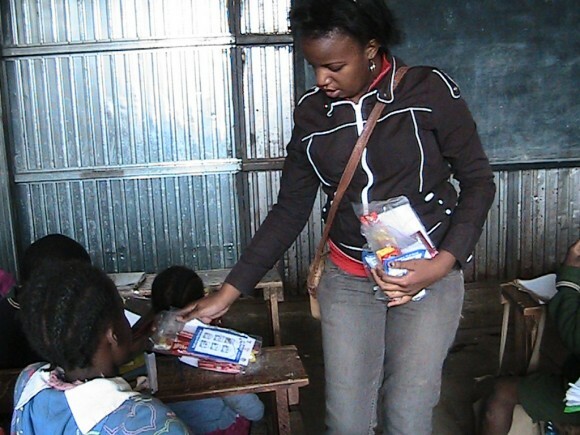 After the demonstrations were complete, the volunteers now spent time making small packs to be distributed to the students, which the students accepted. Some students reacted with smiles, some with thanks, and others just took the packages with blank expressions on their faces. Many things did not go according to plan during the event. The children were not de-wormed for instance. Initially, the reason given was that the school children had earlier been visited by a Christian group from England that had already provided the students with de-worming tablets — which brought into question why the school was selected in the first place and why Julius had accepted Rotary’s offer to de-worm the students. Later, it was said that without a health officer present, de-worming tablets could not be administered, so this would have to take place the following weekend. The school’s headmaster said that while he could arrange for this, they would also require payment. On the one hand, it is my opinion that the Rotary Club had a point: “We are here to help out your community, so you should be willing to help us help you.” On the other hand, I believe they don’t: if the Rotary Club is here to help out, they should do so on the community’s own terms. If Rotary was in fact committed to this event then they should recognize that a health officer from Kibera probably does not get paid much and should expect some sort of financial contribution for taking out the time out to administer medication — be it in their community or not. A future date to de-worm the children was then set up and the chapter’s president said she would provide the 500 shillings (approx. $6) to pay a community health officer to participate. This event is not a new for the Rotary club, so arguably there should have been proper administration and even continuation from the previous years. This time, the event took place at two schools and the children were provided a small tube of toothpaste and a toothbrush. But I must ask: what happens when this toothpaste runs out and when the toothbrush becomes too old to be effective? Is emphasis being placed on the sustainability of a project so that next year’s event could occur at the same sites for follow up and continuation or will Rotary simply select any schools it can? Is Rotary Club “helping” just for the sake of saying they’ve helped? Are they distributing supplies just because that’s what they’ve been given regardless of whether the communities actually need these particular supplies or not? Is there a lack of understanding as to what would best assist the communities? And on the flip side, are resource-poor communities, such as the two schools, simply accepting any volunteers and any donations that come their way? Excellent article. I like how you keep yourself detached in your observations though you are a participant in the events. Great work. Although a sample of toothpaste and one brush may not last an individual child more than a week or two, I would think that simply raising awareness and giving a child who may otherwise never posses a brush or paste or even consider dental hygiene is worth the effort. If even one of these kids finds a way to clean their teeth (an extremely important part of overall body health) in the future and can be prevented from infection or vascular disease, then your effort was worth it. The help may not be long term in that the children wont have the physical donation long (food donations dont last long when given either but the recipients must be better off with some rather than none) but it’s more than most of those kids would have had Rotary not provided it. “We mustn’t allow the perfect to be the enemy of the good” –theodore roosevelte. Poverty is mostly a mentality or cultural matter. What the children of slums need more than a tube of toothpaste is education that allows them to see the world differently than their parents. As such educating children about dental hygiene is an important step in the right direction. A very small step, but a step nonetheless.